All too often smartphone games are sullied by being way too complex. As the power behind the devices ramps up, so the increased graphical fidelity encourages ambitious developers to ape console releases, mimicking triple-A titles of the recent past because, simply put, they’re technically now possible. What many of these games overlook, of course, is the fact that those playing more than likely won’t have a comfy control pad in their hands when they take it on. They’ll be taking on the big blockbuster by tapping a touchscreen. It’s the very fact that Felllice shirks this new wave that makes it feel especially old school – like the kind of game that could have come out in the early days of the App Store and been applauded for fully embracing the strengths of its chosen platform. But, while you could easily argue a Modern Warfare style FPS is never truly going to feel at home on a smartphone, so games like Felllice – where a focus on simplicity appears to have taken precedence over fun – also now has a case to argue. 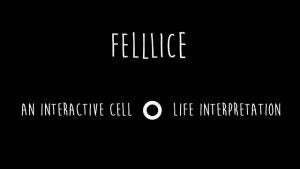 Felllice is essentially a game about order and timing. You control a cell floating around a barren 2D world populated by other cells of varying sizes. In the game’s main mode, the idea is to merge with other cells of a similar or smaller size in order to become the big fish of the pond. This means guiding your cell by tapping anywhere on the screen to send it shooting in that direction. Likewise, a simple tap of a cell you’d like to merge with will result in the two bonding, forming a bigger, bobblier mass. The peril comes from the fact that coming in contact with a cell bigger than your own results in your spore breaking up into its component pieces, with cells shooting out left, right and centre. Such a mistake is a setback rather than a genuine failure, with said pieces being easily scooped back up in the same manner in which you originally acquired them. What makes things slightly more interesting is the fact that, as you progress around the pool, many of the cells begin to fluctuate between different sizes, pulsing from big to small and back again. This means that assimilating with them is a question of timing, scooping them up when they’re you’re junior before they expand back to their full size again. This is as complex as play gets and, with no other goals, barriers or time limits to contend with, you’re free to float around each stage at your own pace, growing to become the dominant cell if and when you choose. It’s relaxing. It’s placid. It’s…frankly dull. Things get a little more interesting in Arena mode when you’re faced with one other boss-like cell, although your actions here are arguably even less defined: against many of your foe you simply have to skirt around their extremities, deftly coaxing the smaller cells off their surface to join with your own. It’s a taxing, tight affair, but arguably not all that much fun – and a sense of merriment in any shape or form is the one element that’s missing from Felllice’s offering. With no real peril to contend with, Fellllice skirts dangerous close to screensaver or tech demo territory. The stripped back visuals (you can choose to switch between the ‘light’ and ‘dark’ side at any time), friendly tutorial and slick presentation are a testament to developer BulkyPix’s experience in the smartphone arena, but minimalist visuals can only get you so far. What Felllice needs to build on its undeniable promise is a challenging gameplay mode that takes the ease of control that is the foundation of its play and turns it into a genuine art. As things stand, there’s not enough here to warrant opening up Felllice once or times to simply admire its aesthetic, with the game proving to be nothing more than the sum of its very pretty parts. Felllice’s stripped back visuals may mean it stands out on an App Store increasingly populated with big blockbusters, but developer BulkyPix appears to have focused on keeping gameplay similarly minimalist, delivering the kind of puzzler that’s so laid back it’s positively comatose. Fun for a quick play around for its take on physics, but Felllice is a long way off being the kind of engaging puzzler it deserves to be. The post Felllice appeared first on Trusted Reviews.